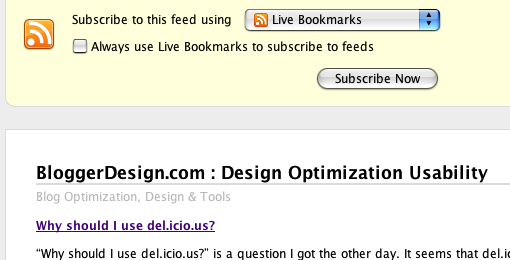 With the launch of Firefox 2 yesterday, one of the nice improvements came with how the browser interacts with feeds. Instead of the default source code view that Firefox 1 showed, Firefox 2 how gives users a nicer layout and the ability to add the feed to their favorite feed reader. No longer is a raw feed seen as ‘scary’ by the average user and, with feed reader integration, it might help more people get into reading feeds without really knowing it. I think Firefox 2 will help people figure out feeds & feed readers on their own rather than try and understand how they work first. Apple’s Safari has been doing this for over a year now and I think that IE7 also handles feeds better. This is just one step in helping the general public understand feeds & feed readers.